Bayeux, a friendly, pretty town with a fine selection of good hotels, makes a great base for visiting all of Normandy and the D-Day beaches. 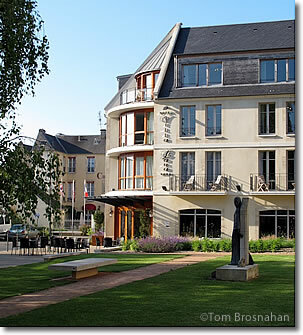 Bayeux has a fine selection of 40 hotels, inns and guest houses (chambres d'hôte) in all price ranges. Most are in the historic center, within easy walking distance of the cathedral, the Office du Tourisme, the Bayeux Tapestry Museum, and many good restaurants. The fine Villa Lara Hôtel on the garden-like Place du Québec and, behind it to the left, the Churchill Hotel.